Following a number of guerrilla attacks in southwest Colombia on Tuesday, the country’s defense minister accused indigenous protesters of receiving support from rearmed FARC guerrillas. Guerrillas carried out five attacks in the north of the Cauca province where indigenous have been protesting for an end to government neglect for two weeks. According to Defense Minister Guillermo Botero, the FARC’s rearmed 6th Front bombed the highway connecting Colombia and Ecuador, near the protests, so that they can transport cocaine to the coast. “It’s all related,” the minister said. 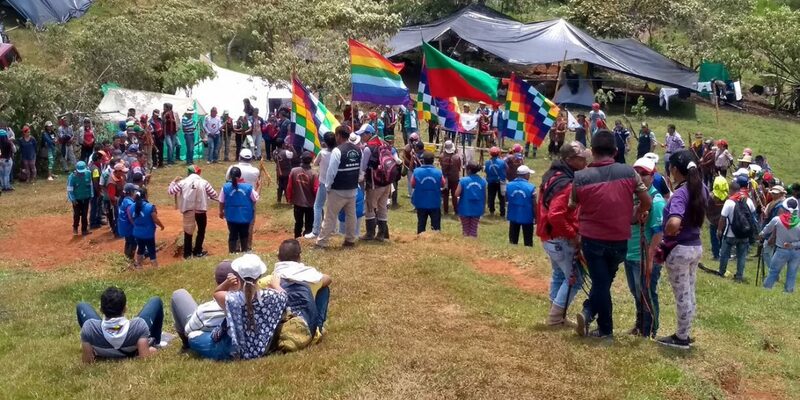 Indigenous spokespersons reiterated that the protest is peaceful and that what happened is the responsibility of the dissidents of the FARC, who have nothing to do with the protest, nor with the petitions they make for their territories. The protests, now in their third week, has been subject to violent police repression, in which an unknown number have been injured. The protest continues without progress towards an agreement between protesters and government, amid a growing public order issue in the region, including a motorcycle bomb planted outside the local mayoral office today. Nobody was injured in the attacks. The pressure is mounting around the blocked road, which is one of the main transit roads across Colombia. More than 5,000 tonnes of food – which has been unable to pass – will spoil in the next few days. More than a million dollars are being lost every day by farmers and local businessmen. Before the protest, indigenous communities in Cauca received death threats from the Aguilas Negras, a far-right group that supports local landowners and is allegedly tied to security forces. In December, the group offered financial rewards for the murder of any indigenous governor, guard, or activist. Rearmed FARC guerrillas subsequently offered protection to the indigenous community, who have rejected all forms of violence and have banned all armed groups from their ancestral territories.